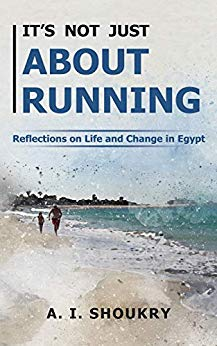 This book isn’t just about running; it’s about a runner’s reflections on life, change, and the love of running in Egypt. It’s a memoir about self-discovery and searching for freedom and love of life. It's about the integration of body, mind, and soul. It’s about family and friends, relationships, and work.Author A. I. Shoukry describes his running moments like a window with a sunrise view for a prisoner kept in solitary confinement. After witnessing a revolution in Egypt, running twice for the parliamentary elections, and being a former leader of two political parties, he decided to take a break from politics and start running. From being barely able to run 2k, he became a half-marathon runner aged 39. In this book, Shoukry explores the meanings of faith, pain, stress, fear, death, life, solitude, happiness, and passion. He has truly put his heart on paper.If you’ve ever dreamed of running—for your health, for your mind, for therapy, or even for parliament, this book is for you. Whether you’re a newbie runner, a seasoned pro, or have never donned a pair of running shoes but want to start—open this book and start running with Ahmed through Egypt.